I suppose it was the perfect day for a hike. There was light rain, temps in the upper 50s and lower 60s and not a mosquito in biting range. However, I had invited Cathy on this hike for the purpose of knocking another lake swim off my list; I was wishing for a bit more warmth. 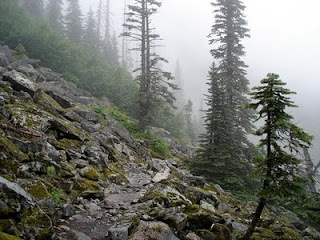 We set out up the well-groomed trail to Talapus and Ollalie Lakes (already swam in those multiple times) and to the ridge saddle to head down to Pratt. I hesitated slightly, thinking about continuing along the ridge but a feeling of regret of not succeeding in my swim forced me to turn down toward Pratt. A trail runner friend had seen a bear somewhere along the trail the day before and, when I say bear, I mean the motherload: a sow and her cubs. I heard some noise like those of wildlife coming from the meadow below, but it turned out to be a youth group doing trail work. The kids had on hard hats with the initials "NYC" and I had a sudden jolt of empathy, thinking about inner-city east coast kids in the wet wasteland of the I-90 trail system. Just to be sure, I asked what it stood for and was relieved when they told me the Northwest Youth Corps. Once past Pratt, we were in unchartered waters, since I had never been past Pratt Lake on this trail. 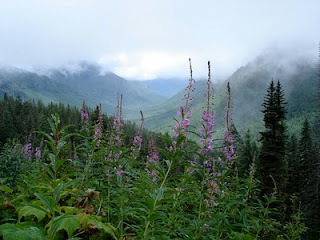 We had a great view of the Pratt River Valley, made dramatic by the clouds hanging low to the mountains. Soon, we came to Lower Tuscohatchie Lake, a serene pool with a waterfall crashing down on the far end. The water was very swimmable and, with Cathy directing me for where to go for the best photo, was surprisingly temperate. While I was swimming, the sun managed a brief visit, as though I was being saluted for returning to the mountains and lakes that I so love. 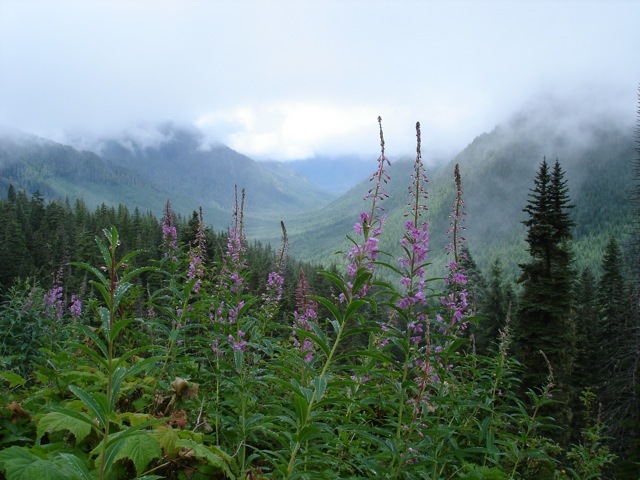 OK, here's the pitch: I am participating in the WTA Hike-a-Thon this year to raise money for trail maintenance, lobbying for wilderness areas and forest protection, a fabulous website and more. It is very easy to donate money and only requires a couple of clicks here. There's no minimum donation, making it a cinch to earn my gratitude.